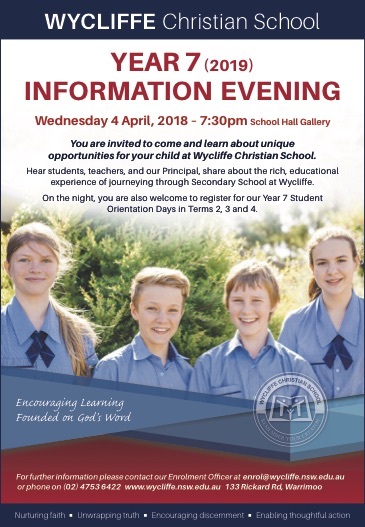 You are invited to come and learn about unique opportunities for your child at Wycliffe Christian School. Hear students, teachers, and our Principal share about the rich, educational experience of journeying through Secondary School at Wycliffe. On the night, you are also welcome to register for our Year 7 Student Orientation Days in Terms 2, 3 and 4. All welcome – no bookings necessary.